Remember when children played outside all day, and mothers didn’t fret about their safety? People strolled the streets at night, unconcerned that their home might be in jeopardy. This wasn’t a TV show. It was life, a few generations ago. Today, with our every move digitally tracked and our location visible to anyone with an internet connection, security has become a major concern. It’s even truer in the workplace, where disgruntled former employees routinely show up and wreak havoc in ways that were seldom a threat in earlier times. Clearly, a higher level of security is warranted in the digital age. We reviewed dozens of outdoor security cameras to identify the best of the best. We looked at connectivity and surveillance area, as well as method of notifications, Amazon reviews, and, of course, price. When protection is paramount, these are the outdoor security cameras we recommend. The world’s FIRST 100% wire-free, HD, Indoor/Outdoor video cameras for home monitoring. 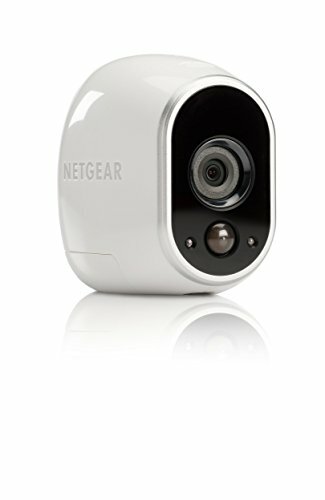 With nearly 16,000 Amazon reviews averaging 4 stars, the Arlo by NETGEAR Smart Security System is clearly a well-loved choice for home protection. Touted as the first 100 percent wire-free HD smart home security system, the Arlo camera is easy to set up, includes free cloud storage, and can be expanded to support up to 5 cameras. Best of all, it works like a charm: both customers and police have reported the Arlo helped them identify and arrest perpetrators — right at the crime scene! Who Should Buy an Outdoor Security Camera? 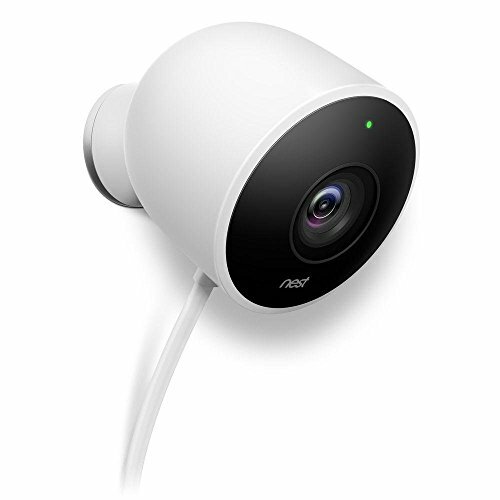 Once you install the Arlo by NETGEAR Smart Security System, with its patented 100 percent wire-free design that affords you a 110-degree view from anywhere, suspicious characters will no longer have the advantage in the dark. Arlo’s night vision, motion-activated cameras record motion and send you real time alerts or app notification (your choice), keeping you on top of what’s happening at home when you’re away. With sharp, live remote video streaming that can be upgraded for even greater surveillance and storage, you can rest assured your family is secure, as Arlo discreetly keeps watch. Exceptional video detail with HD cameras and night vision. No computer required; batteries included. Free apps enable remote monitoring from wherever you are. Can be paired with Alexa for voice control. Keep an eye on what matters to you, from anywhere. For outdoor use. Works with Alexa! In out hyper-busy age, nesting — spending time cocooned at home — has become popular. Nest, the company that created “nested” cooling and heating controls that can be remotely adjusted from anywhere in the world, now adds the Nest Security Camera to its home monitoring mix. The Nest Security Camera works seamlessly with other NEST devices to provide smart, safe security. While it may be a little pricier than other models, its adaptable design ensures you’ll stay informed, no matter what’s happening — even if you’re not at home. 24/7 live streaming in crisp HD (and recording, with a Nest Aware subscription). It’s all there for you to review at any time. Audio and video. Listen to what’s going on out there, receive alerts on suspicious motion — or watch for the kids to get home from school. Plugs into power; never worry about dead batteries. Photo alerts to your phone when something looks or sounds suspicious. Cloud storage enables you to review your history any time. High resolution, high performance, robust home security at a very affordable price. When it comes to outdoor security you might think it’s worth any cost to stay safe. However, you can get excellent surveillance for a very reasonable price, as this outdoor security camera demonstrates. 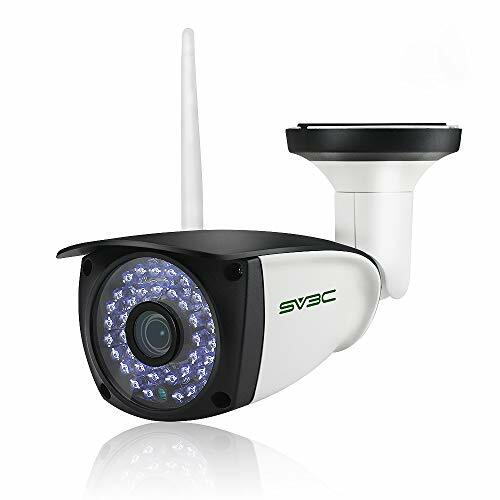 As numerous reviewers attest, the SV3C HD Wireless Security Camera takes good quality pictures even from 60 feet away, and is easy and quick to install, and offers lifetime technical support. Reviewers rave about the friendly customer service! An expandable 8-channel security system that’s easy to install and monitor, with excellent remote access. Once upon a time there was 8-channel stereo. 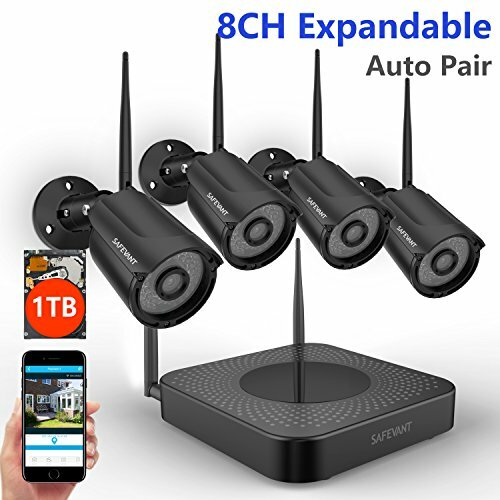 That might have provided incredible sound to scare intruders away, but today there’s a better, more reliable system: the SAFEVANT FULL-HD 8CH 960P Wireless Security Camera System. Amazon reviewers report it’s very easy to get up and running, customer service is exceptional, and it’s worth the price tag. No one will want to mess with your property once they see all these eyes on their every move, providing you with crystal-clear images up to 65 feet away. Continuous, high-resolution recording protects your outdoor area 24/7. Auto pair, true plug and play: Just plug the Wireless Security Camera into power outlets with the power supply provided; no need for cables. Remote view/playback on any mobile device and laptop with CMS software. set a perimeter zone, specify which areas of the camera’s motion grid are active, and even set a schedule for when the alert system is armed or disarmed. You can also prevent false alarms such as plants moving in a breeze. A stylish, wall-mounted motion detection system that includes 2-year battery life and free cloud storage. 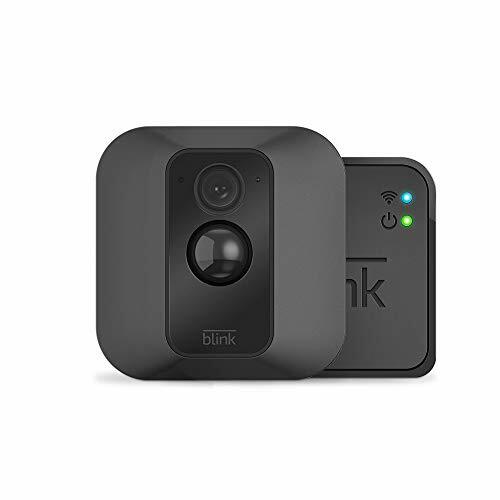 Peace of mind shouldn’t cost a fortune, says the Amazon page for Blink XT Home Security Camera System, and this smartphone surveillance solution has it all: battery-powered coverage you can place anywhere to visually verify what’s going on at home when you’re elsewhere. You can easily expand the system if you move to a larger place, and cloud storage is part of the package, absolutely free. No wonder a number of users enthusiastically give the stylish, completely wireless HD video technology a 5- star rating. Voice activated: Blink is fully integrated with Amazon Echo (Alexa), Echo Dot and Amazon Tap. If you own any of these devices, you can control Blink XT with voice alone. Long-life batteries. The 2 AA lithium batteries included with your purchase are designed to last two years, thanks to Blink’s proprietary chip technology. Home monitoring from wherever you are, on your phone: live steam HD video and audio, with push alerts, from any of your Blink cameras (up to ten per system). Free data storage: no contract or subscription needed. While today’s connected world is a boon for communication, it also means personal and business safety is at a premium. With information about our lives and livelihood easily accessible, this transparency can tempt the unscrupulous to invade your privacy. An outdoor security camera is therefore a necessity for any business facility or homeowner who wants an extra measure of safety and confidence protecting their loved ones and business. Unless your business is 100 percent virtual (in which case you’ll want the best firewalls and other cyber protection), an outdoor security system is a must. We’ve provided you with our top 25 choices from the wide range of systems available so you can select the best fit for your needs, based on such features as wireless vs. wired, scope of motion detection, customizable options, data storage, ease of installation, and price. In the third millennium, every home and business can benefit from having an outdoor security camera. Night vision. Virtually all of the outdoor security cameras we reviewed touted night vision as a key feature. This makes sense, since most intruders wait until dark to gain entry. A camera equipped with adjustable night vision sensitivity means someone attempting to break in is going to show up, clear as day. Busted! Motion detection. Most cameras will send text, audio, or video alerts when they detect motion. This saves on storage, as well as on the video you’ll need to scroll through. If the system can be customized to recognize and omit false alarms, such as trees swaying on a windy night, that’s even better. Wireless versus wired. While high-resolution video might reduce your WiFi broadcast speed, many users find wireless cameras preferable to cables, which can be cumbersome — or cut. Long-life batteries are the optimal way to go with a wireless set-up. Extended viewing range. The best cameras we looked at could transmit clear images from at least 60-65 feet away. Some ranges extend to 100 feet or more. Storage. Does the system provide free cloud storage, or does it offer a reasonably priced recording plan? You want to be able to review, save, and share footage at any time. Weatherproof. Finally, while just about every outdoor security camera claims to be waterproof, in reality weatherproof levels vary considerably. Look for a system that is rated to be fully waterproof in a hard rain, with operating temperatures from 14º F to 122º F.
Do wireless security cameras need batteries? The definition of a wireless camera can be confusing. The term “wireless” refers to the audio/video transmission; many outdoors security cameras still require a cable for power. Newer models are often battery-powered, making them completely wireless. A work-around: you may be able to recharge your camera batteries if you have solar panels installed at your home or facility. Do you need a hard drive for security cameras? While a security camera does need some form of storage in order to record footage and support playback, a hard drive is not essential. You can upload to the cloud, and in many cases, cloud storage will be bundled with your purchase, or offered as an add-on for a low fee. If you want to skip the hard drive, your best bet is a regular IP camera rather than a CCTV system. An IP camera can upload recorded video directly to the cloud. How do CCTV surveillance systems work? CCTV stands for closed circuit TV. CCTV surveillance systems use video cameras to transmit images to one or more monitors, or to a video recorder (DVR). Ubiquitous in retail environments today, CCTV surveillance captures both black and white and color images and sends them to the DVR, where they are stored for playback. Do you need Internet for wireless security cameras? With a little ingenuity, it ispossible to use wireless security cameras without Internet access. If you purchase a surveillance system that includes a WiFi NVR (Network Video Recorder), the cameras and NVR will be able to “talk” to each other without using the Internet. Simply connect the NVR to an HD TV and you will be able to monitor the video feed. We looked at 20 other outdoor security cameras. Even though they didn’t make our 5 best outdoor security cameras list, they’re the best of the rest and each is still a great option for your home or business. The information you’ll need to compare each one is included with the listing. Sound the 110-decibel siren on suspicious activity! This plug-and-play HD security camera has built-in spotlights; the ability to see, hear and talk to people on your property, and a siren alarm. It’s even Alexa compatible. Easy set-up means your security just improved dramatically. The Dericam offers 360-degree pan/tilt visibility no matter where it’s mounted: a full range of vision and protection. A pre-installed 16GB memory card supports recording and playback. Simple setup via iOS or Android and an affordable price make this single outdoor security camera an excellent choice. 355° horizontal pan and 90° vertical tilt rotation range means you won’t miss a thing! This a great deal for an analog camera: engineered for exceptional compatibility, the standard analog chipset enables the camera to work on most BNC-cable systems, old and new. IR LED lighting and 1000 TVL resolution give you optimal picture quality in any given lighting. Heavy-duty construction withstands extreme weather conditions. Lifetime tech support is included. And given the features, it’s one of the most economical security camera we’ve come across. Varifocal lens that adapts to both residential and commercial environments. Quality and cost are the watchwords of this waterproof super HD security camera, which uses Ethernet for both power and data transmission, making it more stable than WiFi. Solidly constructed to withstand not just bad weather but temperature extremes from -4º F to 140º F.
Touted for being both weatherproof and vandal-proof, the Oco Pro Dome provides crisp, full HD images directly to the cloud. Smart motion detection avoids false notifications. Best of all, Oco integrates well with other enterprise video surveillance solutions and business SaaS, from fore alarm systems to POS. Easy to install solutions for small business owners, with multi-user access via iOS, Android, Mac & PC. No NVR/DVR needed. Store free in the cloud for 90 days, and/or on Micro SD card. Enterprise level security includes open API, unlimited cameras per account, extended storage plans, etc. Smart self-learning motion detection system learns every hour you use it. A professional infrared LED security camera for less than the price of dinner out? You bet. And you can enjoy that meal in complete confidence, knowing the TMEZON HD 800TVL is keeping constant watch over your property, with its indoor/outdoor wide-angle lens. The unassuming little Ouvis has it all: HD WiFi enhanced day and night vision, storage for up to 145-hour continuous video, motion detection, and remote viewing so you can check in any time, from anywhere, with the free Ouvis app. And it’s amazingly affordable. Free advanced mobile app for live streaming, video and image sharing, turning night vision on/off, and more. Zmodo Wireless Security Camera System (4 pack) has everything you could ask for in a home or business outdoor security camera. Equipped with infrared lights and IR cut, it serves asyour eyes outside, with adjustable night vision sensitivity. Comes with a 3-year limited warranty, a free month of cloud storage, and lifetime tech support. Multiple viewing options: iOS, Android, and PC websites. The EZVIZ FULL HD 1080p Outdoor Surveillance System is Amazon’s Choice for an outdoor camera, and we can see why: it offers complete home or business surveillance on four channels from anywhere, any time. With lifetime tech support, one button upgrades and a free one-year warranty, it’s an excellent system for the price. The FREDI Security Camera System 8-Channel HD-TVI 1080P Lite Video Security System provides high quality, multi-channel “home security at a fantastic price”, enthuses one Amazon reviewer. Quick and easy set-up by scanning QR Code from your smartphone or tablet. The Funlux 2-pack is a complete indoor/outdoor security system for your home or business at an unbeatable price. Installation is a snap with advanced Zink Technology, and if you do have any questions, lifetime US-based tech support with live chat is there to help. Two-year warranty. The Bechol 1080P HD Wireless Security Surveillance IP Camera System delivers a clear view of what’s taking place on your property, day and night. Plug and play remote viewing affords an excellent range and is easy to configure, access and operate. With 4 cameras providing 24/7 coverage, your security is strong with this surveillance system. All-in-One 12″ LCD monitor with built-in video recorder provides indoor/outdoor protection suitable for home, office, retail, hotel, etc. The Wansview Outdoor Security Camera is one of the best bullet cameras for its price point, offering high quality video, remote viewing via a free mobile app, and ONVIF protocol with excellent compatibility with most NVRs and third party software. The latest HiKam A7 describes itself as “Super Intelligent Human Detection”, which may be why the 2018 version is Amazon’s Choice for wireless outdoor security cameras. No IT know-how needed; just a simple 3-minute set-up and one-click live streaming. Advanced human detection: the leading A7 technology filters out false alarms, so you won’t receive alerts for swaying branches or an animal sprinting across your yard. Built-in microphone so you get audio as well as video feedback on recordings. Receive notifications 24/7 via your preferred device: iOS, Android, tablet, Windows PC, MAC (beta). Like its name, the 4SDOT Outdoor Security Camera is a short, sweet deal: easy set-up, excellent customer support, great price, quality pictures. Low power consumption with high stability. It’s Amazon’s Choice in its price range for Outdoor Wireless Security Cameras. The Amcrest 2K 3MP provides powerful yet simple, smart wireless security for your home or office. With night vision, motion detection, multiple storage options, lifetime tech support, and a very attractive price, Amcrest is right on the money when you’re choosing a dependable surveillance system. HD resolution in 3 Megapixels with an Ambarella chipset stream crisp video clarity. Alexa compatible. Knockout night vision: 30 IR LEDs let you see up to 98 feet in the dark. Store video and alerts in the cloud, on your hard drive FTP server or NAS. The Foscam FI9800PR is an intelligent security system with a track record for reliability and value, as this smart little bullet camera demonstrates. With rich video, two-way audio, clear day and night footage tailored to your needs, and smart alerts, your business or home will be safe, no matter where life takes you. A suite of storage options, including free FTP, NVRs (not included), hard drive, or the cloud (30 days free). For $15, you could buy a couple of sandwiches or a ZOSI 1000TVL Outdoor Indoor Security Camera. The Zosi might not be as tasty, but it’s a far longer-lasting investment for the price. And does it ever work. One Amazon reviewer posted the video of an intruder who broke into their weekend cabin and was beautifully captured on video, enabling police to make a positive ID. One year warranty and lifetime tech support. Professional level security without the “professional” price tag. This describes the R-Tech 1000TVL Outdoor Bullet Camera, which provides HD analog video with powerful new SMD infrared LED lighting, reaching an astonishing 180 feet — and with longer lifespan than traditional IR. Back Light Compensation for crisp picture quality in any lighting conditions.